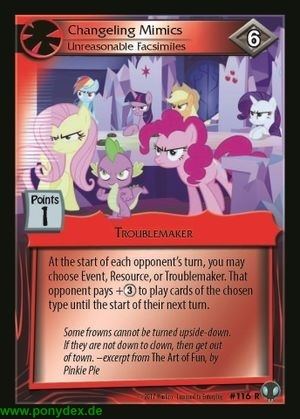 At the start of each opponent's turn, you may choose Event, Resource, or Troublemaker. That opponent pays +3 AT to play cards of the chosen type until the start of their next turn. Some frowns cannot be turned upside-down. If they are not down to clown, then get out of town. - excerpt from The Art of Fun, by Pinkie Pie.